VESDA (Very Early Smoke Detection Apparatus) - VESDA devices belong to very early smoke detection suction systems. VESDA System proves to be effective regardless of the environment. The device continuously collects samples of the air in the monitored space and laser-analyzes its composition in order to detect elements of smoke. VESDA System detects fire at an early stage which minimizes the possible damage. For example classic smoke detectors would need 1000 more smoke elements in order to detect the fire. The installation of the device is simple and it does not require special arrangement of the room for that purpose. The air from the monitored room is transmitted to VESDA by the PVC piping system (pipes 20 mm in diameter). 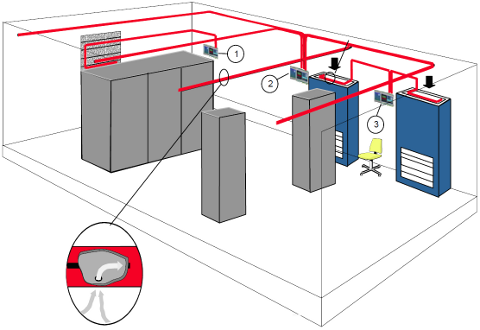 In order to optimize the efficiency of the VESDA system piping covers precisely the entire room – installation are placed above dropped ceiling, under raised floor and directly in the room. 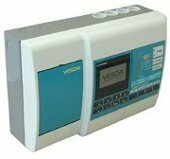 VESDA devices transmit fire alarm signals to other devices, e.g. building’s control panel for Fire Alarm Notification System.